Academic excellence and student access. These are the critical elements of the University of Michigan Ann Arbor’s budget recommendation again this year. Our 2016 Fiscal Year General Fund budget recommendation presented here, seeks to leverage a very modest increase in the state appropriation and the university’s ongoing cost-containment efforts to enhance academic excellence and improve student access. Other priorities reflected in this budget recommendation are providing additional resources to improve the campus climate for a diverse university community and adding resources to meet the growing needs for specific student services and ever-increasing compliance requirements. We believe we are able to accomplish all of that with a modest tuition increase for undergraduate students. Data science: “Big data” is a topic that has skyrocketed in importance during the past five years. To fulfill our core mission strategies of offering a world-class education and conducting leading-edge research, we must expand our presence in this critically important field. The program we recommend for investment is designed to capitalize on U-M’s strengths by complementing work on data-science methodologies with a focus on application areas where we are already leaders, including personalized education, transportation systems and certain areas of personalized medicine. The program also honors our commitment to undergraduate and graduate teaching by coupling a significant educational component with a strong research component, and building on our existing structures in areas such as statistical consulting and training. Directly related to this data science initiative is a new undergraduate major in data science that will be offered jointly by the College of Engineering and the College of Literature, Science and the Arts starting this fall. Humanities collaborative: It’s easy to find reports indicating that the humanities are in crisis. But who will lead the effort to redefine the humanities for the 21st century? With some of the nation’s finest programs in classics, philosophy, English and Romance languages, and more, we have an opportunity to take a national leadership role in this area. We would accomplish this by responding to the emerging environment in which humanities faculty members pursue their scholarship, communicate it and train the next generation of academic humanists to transform their fields. Specifically, the proposed humanities collaborative would support large-scale projects that include multiple faculty members across disciplines – something new to the humanities, but strongly supported by some of our leading scholars. The involvement of students will be key, as will attention to public dissemination through exhibitions, displays and other public programming. Inter-Professional Health Education: The complexity of modern health care requires a collaborative, multidisciplinary team approach. So does the education and training of future health-care professionals. While many universities recognize this need, U-M is extraordinarily well-positioned to lead in inter-professional health education, because of its broad array of health-sciences schools including, Dentistry, Medicine, Kinesiology, Nursing, Pharmacy, Public Health and Social Work. There is strong commitment among the faculty and leadership of these schools to develop inter-professional programs, something already being done on a pilot basis. These programs will include a well-coordinated set of cross-disciplinary, team-taught courses and co-curricular activities that reflect the way health care is delivered today. Outreach programs designed to make sure more students from within the state of Michigan are academically prepared to enroll at U-M.
Programs that improve the climate on campus for students from underrepresented groups such as the successful Change It Up! program offered by University Housing. Professional development experiences for faculty members to enable them to more effectively address the challenges of teaching in multicultural classrooms. Additional support for students who come to our campus with different backgrounds and perspectives, including students with disabilities, and students who are among the first generation in their families to attend college. A diversity strategic planning process that will include careful assessment and a requirement of accountability for all programming that addresses diversity and inclusion. Across the nation and certainly across the Ann Arbor campus there is a growing need for mental health and disability services for students, assistance for international students, and sexual misconduct prevention educational efforts. This budget recommendation addresses critical needs in all four of these areas. In the fall of 2014, the total number of students seeking services through Counseling and Psychological Services (CAPS) increased by 20 percent over the previous year. At that same time CAPS, with a home base in the Michigan Union, placed clinicians in the four North Campus-based schools to more effectively deliver tailored, confidential services to the students in those schools. The results of that change were excellent, and this year’s budget includes additional resources to enable CAPS to take a similar approach with the Central Campus graduate and professional schools of Law, Dentistry, Rackham and the Ross School of Business. With more than 2,200 students registered for services – more than any other Big Ten university – the university’s Services for Students with Disabilities office now serves more than 5 percent of the student body on the Ann Arbor campus. This is nearly a 100 percent increase in the number of students begin served since 2009. The budget recommendation includes funds for an additional counselor to allow the office to meet the growing demand for services that student and faculty find essential to providing the academic accommodations that allow these students to thrive. Similarly, the university is a national leader in the education and prevention efforts regarding sexual misconduct among students. To ensure that we can continue to respond to the needs of the campus community, this budget recommendation provides for additional resources to add a senior staff member in Student Life to develop and administer campus-wide prevention and bystander intervention programming. Additionally, the Office of Institutional Equity would add a specially trained sexual misconduct investigator to shorten the amount of time it takes to complete these important and sensitive investigations. Thanks to the university’s multi-year approach to budget forecasting, we were able to respond early to the economic crisis of the mid-2000s. This allowed the university to start cost-containments efforts very early and they continue to be reflected in this budget recommendation. Since FY2004, we have reduced or avoided recurring General Fund expenditures totaling $313 million. 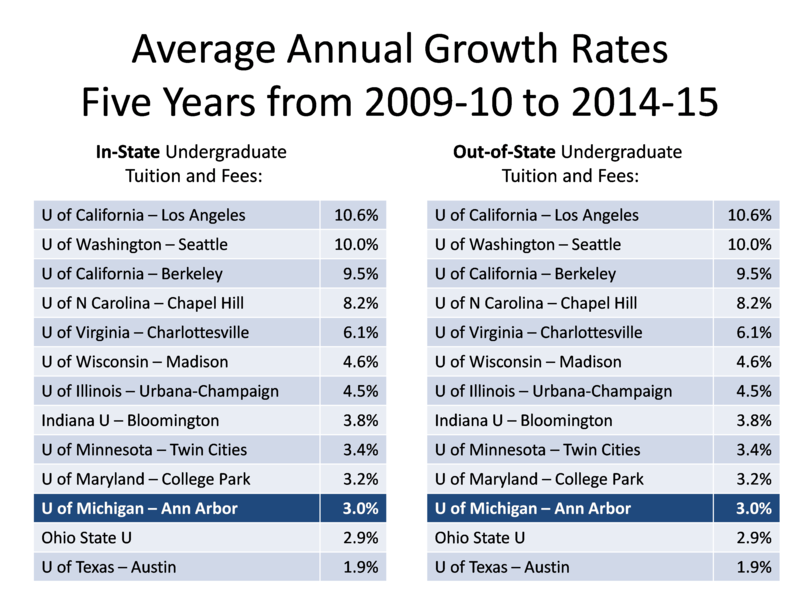 By remaining relentlessly focused on strategic cost containment, the university has been able to avoid program cuts and still keep tuition increases low throughout one of the most difficult economic periods for the state of Michigan. In recent years, we have had to look deeper and more broadly at the academic enterprise for savings. Yet we always work to protect the quality of the academic experience for students. Consolidation of certain information technology services common across the university such as security services, unified networking and data storage. The centralization within the new Shared Services Center of specific finance and human resource transactional activities. Ongoing savings related to benefit changes and strategic vendor contracting. A host of other efficiencies, such as a change in the process for non-hazardous waste removal. Philanthropic giving is also critically important, as it provides an alternative revenue source for some of our needs, allowing us to shift costs off the General Fund. For example, the Ross School of Business received a $20 million gift to name and permanently endow the Sanger Family Leadership Center, formerly known as the Ross Leadership Initiative. This gift will fund approximately $100,000 of the center’s annual expenses. Separately and as a result of their fund-raising efforts, five academic units will be able to shift more than $850,000 of scholarship funding off the General Fund to donor funds and two academic units are able to use increases in their endowed funds for faculty appointments, saving another $131,000 in expense on the General Fund. In addition, schools and colleges across campus engage in continual reallocation of resources from lower-priority activities to higher priorities. One example is phasing out low-enrollment classes and academic programs and shifting faculty lines accordingly, such as the recent closure of the Master of Science degree in entrepreneurship. We also are beginning to realize a modest amount of alternative revenue from our MOOCs – the massive online enrichment courses that we offer to the world. Other examples of efficiencies include centralization within schools for event planning services and administrative support. Partnering across academic organizations also is occurring as smaller schools take advantage of established processes and resources at larger schools, such as for visa processing and technology support for researchers. One of the key aspects of the General Fund budget recommendation is our ongoing emphasis on keeping the university accessible to all students through a comprehensive program of financial aid. 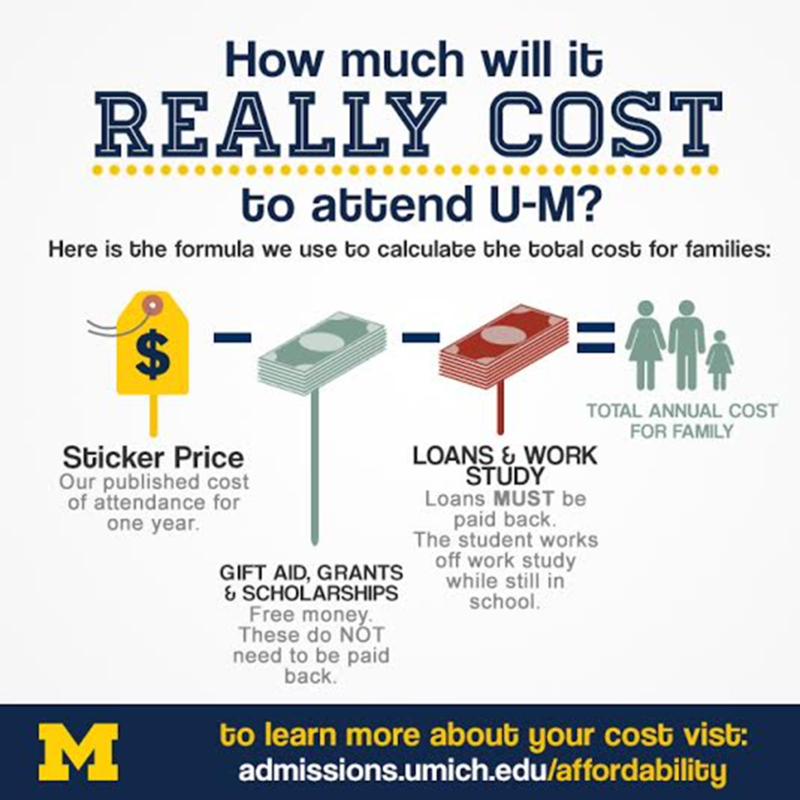 Perhaps the best way to understand the significance of this investment is to hear from those students who would not be on the Ann Arbor campus were it not for financial aid. Kathryn Thomas, Logan Meyer, and Samantha Sims are three of those students. All are “first-generation students”—from the first generation in their families to attend college. Kathryn Thomas is a movement science major from Pontiac who plans to apply to dental school after taking a year off after her 2016 graduation. She graduated from the Advanced Technology Academy of Dearborn, a charter high school. Her financial aid package includes scholarships, grants, loans and a work-study job. She says her acceptance at U-M was a dream come true for her parents. “They wanted us to have something they did not have,” she says of her brother and herself, who are both attending U-M.
And she has this advice for students who are thinking about coming to U-M but aren’t sure: “You never know until you try.” She says she has learned from her own experience that if U-M accepts you, the school will help you afford the costs of attending. Logan Meyer is another first-generation student at U-M pursuing a bachelor of science in information degree. Strong support from his parents and a financial aid package including a university grant, a work-study job and subsidized student loans made it possible for him to seize the opportunity of a lifetime when he was accepted at U-M. He says his parents instilled in him an appreciation of higher education and it’s an experience he hopes to encourage others to seek. When it was time for Samantha Sims to fill out her college applications, she was drawn to the University of Michigan for its top academic reputation. She was always a good student, she says, and her mom had always told her she would be going to college some day. Sims has a financial aid package that includes scholarships, U-M and federal grants and she qualifies for work-study jobs. She is working this summer in the U-M Housing Office. She said she knows what it feels like to think you cannot afford a school like Michigan and she credits her high school teachers and counselors for helping her understand how much financial aid is available. About 70 percent of our in-state and 50 percent of our out-of-state students receive some form of financial aid. This budget recommendation provides funding for increased financial aid to cover the modest increase in the cost of attendance for all students with financial need. And for most in-state students with financial need, there will be no increase in loans. We also will continue to provide financial aid for out-of-state students. With approval of this budget recommendation we will be able to meet full demonstrated financial need through a package of grants, loans, and work-study jobs, for out-of-state students from families with incomes of up to about $68,000 a year. The 2016 Fiscal Year General Fund budget recommendation is built upon a commitment to maintain and enhance the academic excellence of the university and provide wide access for students to the broad array of educational opportunities on the Ann Arbor campus. It is a budget recommendation that reallocates financial resources and again stresses efficiency and cost containment to make good on that commitment. It invests in new, strategic, highly collaborative initiatives as well as programs that enhance the campus climate for students, faculty and staff from all backgrounds, it ensures that we fully satisfy compliance requirements, and it provides the resources necessary to offer modest salary increases for faculty and staff. It fulfills the university’s commitment to access and affordability with an 8 percent increase in undergraduate financial aid, covering the increased cost of attendance for most students with need. And it extends the university’s more than decade-long commitment to fiscal discipline by trimming an additional $24 million in recurring expenses from the General Fund through a continued focus on operational efficiency and seeking alternative sources of revenue. 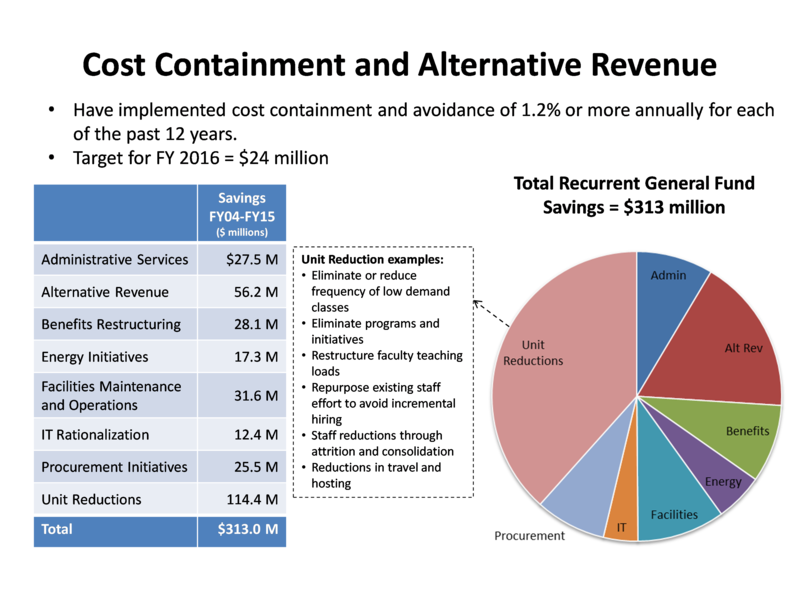 Once implemented, this $24 million in reductions will mean that since 2004, $337 million in recurring expenses will have been trimmed from the General Fund budget, allowing resources to be reallocated to higher priorities and constraining tuition increases. The General Fund budget recommendation for the Ann Arbor campus is a carefully balanced spending plan that provides the resources necessary to enhance the academic quality of a world-class institution while maintaining access for a wide range of students. Revenue to the General Fund comes from three main sources: tuition, state appropriation and indirect cost recovery on sponsored research. Indirect cost recovery pays specifically for the indirect costs of research, making this funding not available for allocation on a discretionary basis. The revenue to pay for budget priorities for FY2016 thus would come mainly from increases in revenue associated with tuition and fees and an increase in the state appropriation, complemented with resources made available through costs cutting and reallocated expenditures (see Table 1). 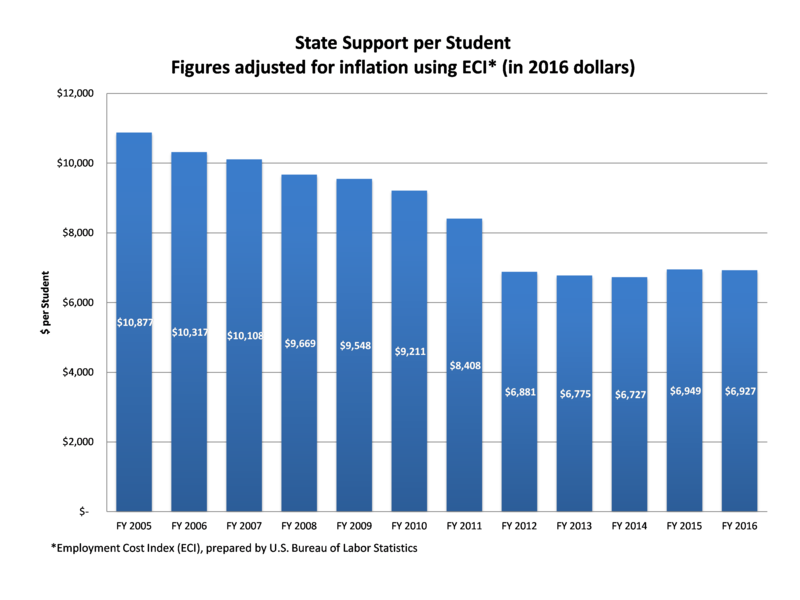 Year-over-year change in tuition revenue is a function of class size, the proposed tuition rate increases and a small projected increase in the proportion of out-of-state students. The $1.83 billion General Fund budget, detailed in Table 1, is based on an approved state appropriation of $299.4 million, an incremental $24 million in cost containment and reallocation, and a recommended lower-division, undergraduate tuition increase of $370 a year – 2.7 percent – for in-state students. The increase for out-of-state undergraduate students would be 3.7 percent. Tuition for most graduate programs would increase 2.7 percent. A limited number of differential increases also are recommended for specific programs.